These two are awesome! 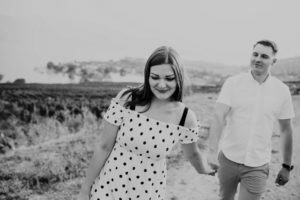 They came up for the weekend from Vancouver for some planning of their August wedding at Off The Grid Winery and of course a fun engagement session with me. I was excited when Josh emailed me with a plan to propose to his girlfriend Natalia at Quails Gate Winery. On a smokey evening, Josh led Natalia up a row of vines where I was waiting to catch him get down on one knee. It was such a perfect moment! Congrats to you both!! I have to say, these two were quite adorable. I met Antonina & Volodymyr at Quails Gate Winery for sunset engagement photos. We couldn’t have had better weather and the lighting was too perfect! And these two… nothing but charm and smiles. 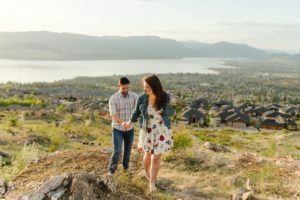 I hiked up Kuiper’s Peak with Nelson and Charlie to get some truly beautiful views of Kelowna. 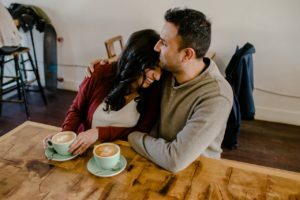 So many laughs through this entire engagement session. I love how Nelson & Charlie really express the fun they have with each other through these images. I am looking forward to photographing their wedding in just under 2 short weeks. I got to spend a Sunday afternoon exploring Kalamoir Park with Belle & Dave and their adorable little pup, Judo. Belle organized a beautiful picnic with wine down by the beach, then we headed up the mountain for some spectacular views. I am looking forward to their beautiful garden wedding this summer! Check out the photos from our session below.